Does this kind of seam/technique have a name I can search for? That seam looks like topstitching. It's done using a straight stitch, typically set to a longer stitch length than construction seams. Topstitching can be a decorative finishing technique, but also serves the purpose of keeping seams flat and in place. It looks like the example is made of a leather-like material - topstitching is very common for that, since the material won't fray and tucking the raw edges under would make seams very bulky. If you want to do the stitching for this particular item by machine, you can try holding the pocket out so only the pocket edge is under the presser foot, but you will have to be careful when feeding it through to keep the seam even. 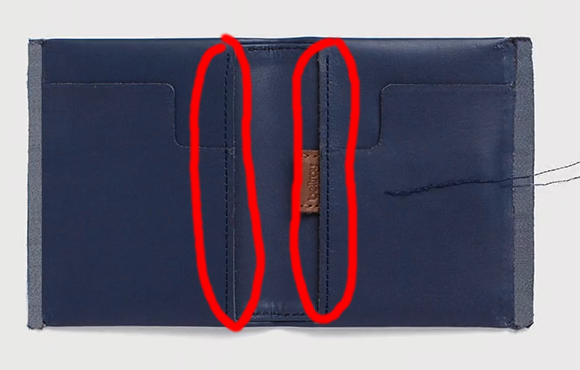 This looks possible with the pattern - since you haven't stitched the ends of the wallet yet, it'll be like sewing half of a cuff (only a bit more stubborn depending on how stiff the leather is). It would be easier to topstitch the pocket before assembling, so it's just a flat piece you run through the machine, but that would require changing the pattern so the back section and the pocket sections are separate rather than one continuous piece. How can I handle the existing thread from a broken seam? How should I select elastic for a sewing project?